Be our guest in our beautiful situated Casa Montana. 2 WEEKS OR MORE ; ask our best offer. Quality furniture, airco, perfect beds and great views give you the perfect Spanish feeling !! The location of Casa Montana on the 5 star Mazarron Country Club is perfect with views over olive-fields, mountains and hills.Behind the house you walk into beautiful Spanish gardens. 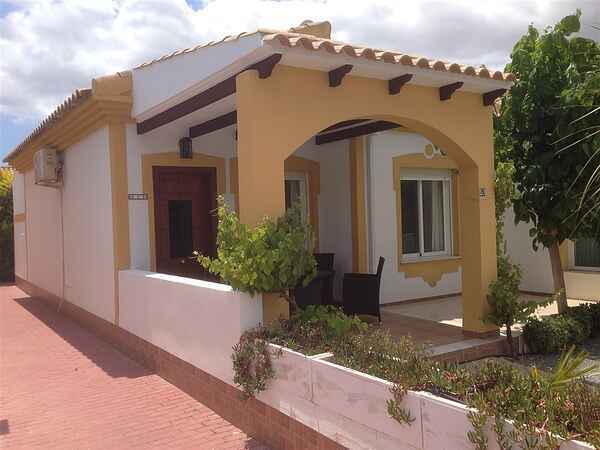 But also less than 10 minutes from the beautiful Costa Calida coastline with great beaches and villages. You find bays were you and your family feel like being on a private beach. On the resort is a very nice public pool. You can play tennis, jeux de boules etc. and afterwards go for a meal or a drink in the restaurant. Within a few miles you find the shops. In the area are several historic towns like Cartagena, Murcia and Lorca. Dont forget to visit Natural Park "Sierra Espuna" near Totana during your stay in Casa Montana Mazarron/Murcia. We are sure you will have an unforgettable holiday in our Casa Montana. Sent us an e-mail to ask the availability and ask us everything you want to know. We will reply as soon as possible. Villamazarron can also offer you villas with private swimming pool. Take a look the website of Villamazarron. LIKE TO BOOK A LONG PERIOD or WINTERSTAY ; ask our special prices !!! Best regards and we hope to welcome you in Casa Montana.